Join us as we take a trip down memory lane and look back at the beat ’em up classic ‘Battletoads’. Well, it was *&*$%@# hard. That’s a start. It is actually still considered to this day to be one of the hardest video games ever created. Now imagine playing it as a young child? Regardless of that fact, it was incredibly fun to play, mainly because the action was fast-paced and did not let up for one second. It was also fun to slam the buttons as hard as you could to really give the ‘Beat ’em up’ tag its dues. While the objective was to ‘Beat ’em up’, the game was played out as a classic platformer. Players had a variety of ways to take out the enemies. You could headbutt, kick, punch, and use special moves. At times you could even transform into a wrecking ball to show that bad guy who was boss. Chaos, really. Rash, Zitz, and Pimple (fantastic names, right?) are the Battletoads and they are tasked with escorting Princess Angelica to her home planet with Professor T. Bird. Things take a turn for the worse when Princess Angelica and Pimple are kidnapped by the Dark Queen, and a rescue mission involving Rash, Zitz, and the Professor follows. 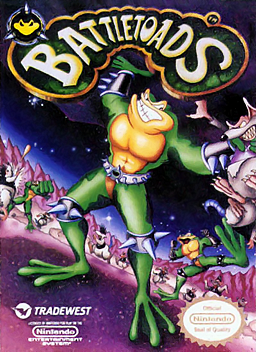 Depending on who you believe, ‘Battletoads’ was created as a way for the developers to jump on the ‘Teenage Mutant Ninja Turtles’ craze of the time. While this seemed silly at the time, as clearly ‘Teenage Mutant Ninja Turtles’ had the market cornered, it turned out that ‘Battletoads’ became hugely popular, with some gamers shelving ‘Teenage Mutant Ninja Turtles’ to get their Toads fix. The game was very well received and has game scores around 90% from the majority of reviewers. It was just a very well made game which challenged the skills of the gamer. It was a lot of fun too. Best part about the game? It was quite a violent game, so as a kid this was amazing. Your parents wouldn’t care less as long as you were busy doing something, so you could get away with experiencing this level of violence for yourself, without a nag from your mom or dad. This period for gaming was not as controlled as it is today, so kids could get away with it. Well, until your folks caught on, that is. The characters were also cool, and their names lead to many a joke being spawned. The non-stop action was without doubt the engrossing part of the game, as it required you to be 100% focused on the job at hand. The game also left you with very sore fingers. In short, it was just a fun game to waste some time with, regardless of the fact that very few gamers ever managed to finish it, due to its difficulty level.